if you need design a new retail store or redo your old store. (1) A clear good looking retail store with a simple and moden style showcases, no matter the showcase is veneer or just 2 pac or even laminate and fomica finish, when you put all of them together, they look clear and clean and good moden style, tha't what we need . (2) LED lights, we can't image at 2003 year, one retail jewelry still still without lights or drak normal halogen lamp lights inside of the showcases or ceiling of the store, if so few customers or no customers, it is the reason we find and we need think about it .The beautiful lights is very important for the jewelry whatevery it is fine jewelry, gold or crystall, gemstone or expensive diamond, we need the lights from yellow to cold white from 4500k to 7000 K, a store with such bright led lights whenever the jewelry inside of the showcases or out of the showcases they are still have the led lights give the beautiful lights to the jewelry, that;s we have to make sure our jewelry have the lights in store . (3) The good quality showcases including the hardwares, truck, lockes and safe glasses, noone want to open the drawers less than one month then find the truck have problem and we can't open the drawer or can;t close preject .The worst thing is bad lock, we can't image if the showcase' locks have problem we can't open or can't close when customer are talking with us, how terrbile it is . We have to make sure all of the hardware we choose for the showcases they are enough quality for the normal use days . 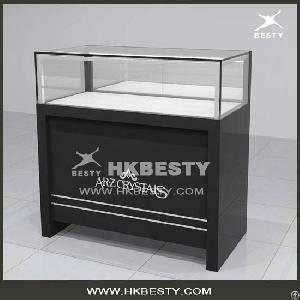 (4) The glasses, now even all of the store we buy the insurance, but a good quality tempered glasses still is importand, choose the BS6206A :1995 certificate for the glasses, even we don't 100% keep the jewelry safe like in safe boxes, we still have one way to keep the thief out, trust me a stupit thief don't know how to make the BS6206A glasses broken . Lastly if you want to talk with me or call me I am alwaya here in HKBESTY factory for many years, any e-mail or any calling willl be welcome . Note :we will go to JCK show in LAS Vegas If you have time pleas meet you at next JCK SHOW .